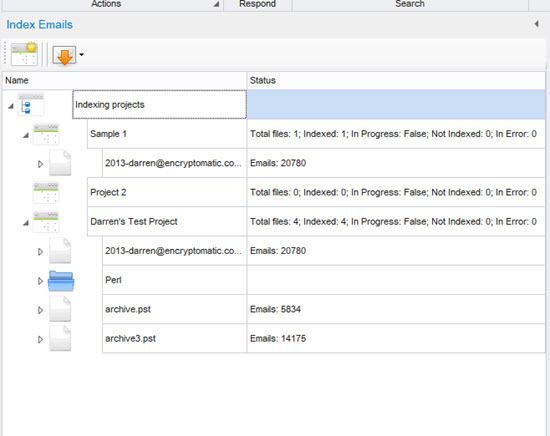 Encryptomatic MailDex emailing viewer software. Take control of your email problem with MailDex®. Build a project-based searchable index of email content. 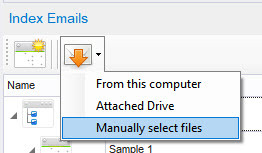 Find important emails fast, then process them from the source data file. Bulk print, PDF, convert emails. 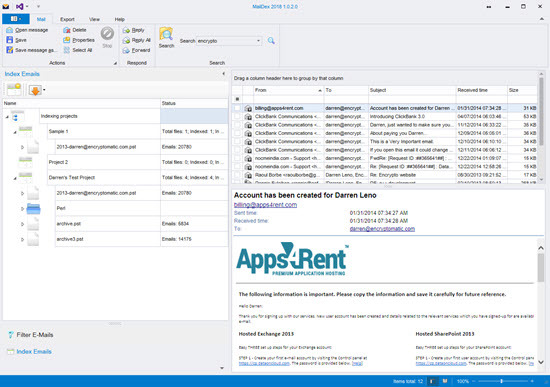 MailDex® by Encryptomatic® LLC is a Windows software tool for indexing, discovering and converting emails. MailDex works across many different email formats, including Outlook .pst, .ost, and .msg files, and .eml, .mbox, winmail.dat, and .mht files. With MailDex, you can discover important emails hidden among millions. Use MailDex to organize, find, archive, and discover important email content. MailDex is a precision tool that is in active development. We provide several avenues for support, including telephone, live chat, online and email. Because MailDex is built for demanding users who require reliability and acurate results, the MailDex team acts on user feedback when improving the product. By now you probably have learned that email software field is littered with junk products offered by anonymous people. We know that, too, and so we work hard to earn and retain your trust. Support. Reliability. Active development. Quality results. We're a transparent U.S.-based company. This, and more, is what sets MailDex apart. 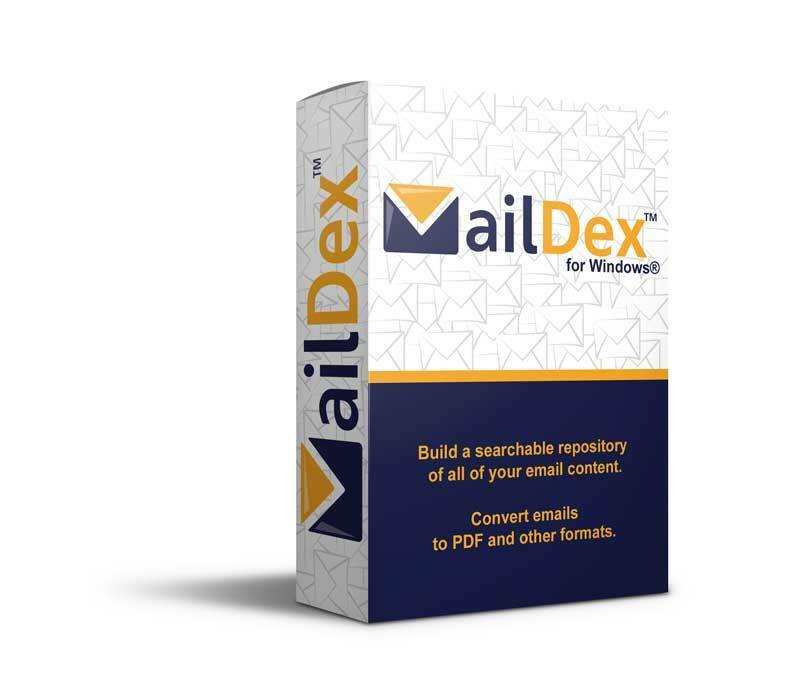 MailDex has an advanced proprietary email rendering engine able to accurately display complex Microsoft Outlook messages, including Rich Text emails with embedded graphics and special formatting such as shapes, SmartArt and embedded charts. Hundreds of non-standard email formatting exceptions have been identified and individually included, enabling MailDex to render emails that other products can't. This means you get highly accurate images when converting email to image documents such as PDF. Reply and forward to email messages from MailDex using your default Windows email application, such as Thunderbird, Outlook, or any other email client that supports Simple Mapi. MailDex is project driven to provide you with good work flow. For example, a law firm performing discovery on multiple cases can establish multiple projects. This simplifies discovery and prevents content mingling. With MailDex, you can create an unlimited number of projects. Each project can index an unlimited number of emails. Search across one project, or search across all of your projects. Email files within a project may be removed from your MailDex index at any time. Delete any project without affecting any other projects. Begin using MailDex in two simple steps: 1), create a project, 2) add emails to it. After a brief indexing period, you begin searching your project indices. MailDex natively supports indexing of many different types of email content. You can add Outlook .pst, .ost or .mbox email files, or select a Windows folder with .msg or .eml files or a mix of email content. MailDex immediately begins indexing email content after it is added to a project. The status column keeps you informed of the indexing progress. MailDex is optimized for fast indexing, exceeding 12,000 emails per minute on a modestly resourced computer. When indexing is complete, your searches of email content will return lightening fast results. If you work with Controlled Unclassified Information (CUI), MailDex can be set to respect CUI tagged emails during export operations. Activate this feature by selecting the "Exclude CUI" option on the export tab. Export emails from Microsoft Outlook PST files to PDF documents. It also exports msg, eml, ost, mbox and mht files to PDF. A range of pdf export options lets you decide how to handle email file attachments: extract them to a disk, convert them into the pdf image, or embed them as individual files. Support is included for ISO 19005-1, an important email archiving standard also known as PDF/A. Index and search .pst files created by any version of Microsoft Outlook, including newer Unicode and older ANSI formatted .pst files. System administrators are able to customize the user interface, removing features their users don't need. An .msi file supports silent deployment and silent registration. 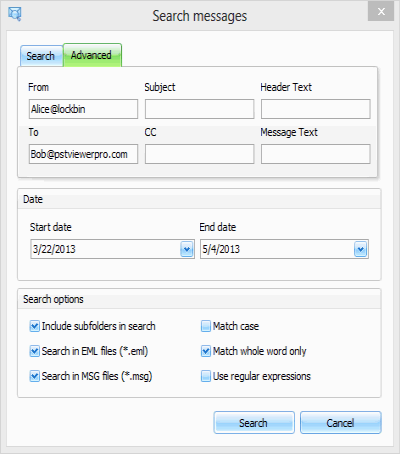 Find the email messages you need with advanced search options. Use "quick search" to sift through emails fast. Use "Advanced Search" when you need to specify multiple criteria. Search a specific range of dates, sender, or the recipient's email address. After performing an email search with MailDex, you may have a large set of emails needing closer analysis. To support this, MailDex includes message filtering. Very complex filters may be built and then re-used on different search results. You can apply different filters to the same email set. MailDex software is distributed as a code-signed .EXE executable and as a .MSI Windows Installer Package. The executable version will check for required Windows components and offer to download and install any that may be missing. In enterprise environments, a .msi distributable file is available. License activation and silent installation can be accomplished by using the command line parameters specified in the help file. An activation free version is available for enterprise site license customers and for use in some shared environment settings. MailDex® minimally requires Windows 10/8/7, .Net Framework 4 or later, 2 GB RAM, 1 GB disk space, and 2 GHz processor. We recommend 64-bit Windows 10, 8 GB RAM+ and 3 GHZ+ procesor. More resources are better. If you require more information, contact our sales team at +1.651.815.4902 x1 or email sales-at-encryptomatic.com. For product assistance, please open a help ticket. To uninstall MailDex, run the installer app and choose "Uninstall," or use Windows Add/Remove Programs service. EULA. Microsoft®, Office® and Outlook® are registered marks of Microsoft Corp. MailDex®, and Encryptomatic® are registered marks of Encryptomatic LLC.